New Haven, CT- Dartmouth traveled to New Haven for its first away Ivy League game of the season. With a couple of injuries, the Big Green had to move a few players around, however the offense ran smoothly as Dartmouth had its highest scoring game of the season so far. Dartmouth came out firing against Yale and a hard run from prop Krieg Greco put Dartmouth on the board at 7-0. A few minutes later some quick feet from fly-half Dawit Workie gave Dartmouth a 14-0 lead. Things continued to go well for the offense and some nice ball movement led to a Struan Coleman try as Dartmouth went up 19-0. A dropped ball in the try zone led to a great heads up play and try from wing Julien Johnson extending the Dartmouth lead to 24-0. However, Julien was not done and used some speed to get a second try just a few minutes later as Dartmouth went up 29-0. Dawit Workie’s stepping proved too much to handle for the Yale defense as he danced into the try zone making the score 34-0. Quick ball movement to the wing led to a 2 on 1 and a selfless offload from Julien Johnson led to a Max Parker try giving Dartmouth a 39-0 lead. After a lot of backs action, the big men were anxious to get some of their own and a crushing run from Kreig Greco and an offload to Steven Hinshaw gave Dartmouth a 44-0 lead. 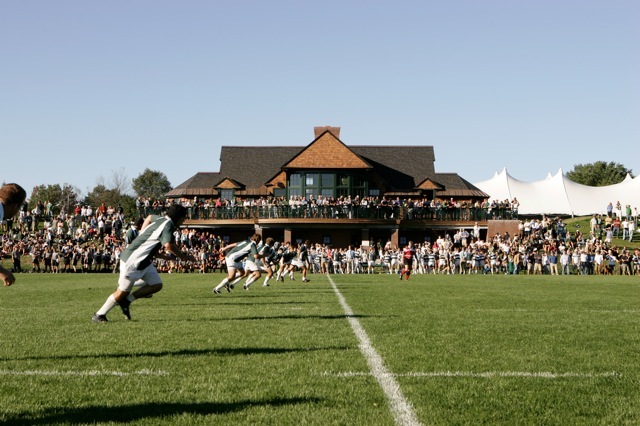 Just before halftime, a great run from Benji Hannam led to a Luke Beinstock try as Dartmouth finished the half at 51-0. With a comfortable lead and ball possession to start the half, Dartmouth made a number of substitutes to give some other players a chance. After closing out the first half with a try, Luke Beinstock got Dartmouth off to a good start with his second try of the game and extending the lead to 58-0. Hayden Aldredge hit a hard line and put one down under the posts extending the lead to 65-0. The forwards continued their dominance and an offload from Steven Hinshaw gave Struan Coleman his second try of the game putting Dartmouth up 72-0. Max Parker blew by a whole number of Yale defenders and put one under the posts increasing the lead to 79-0. Just before time expired Gordon Driscoll offloaded a beautiful pass to Hayden Aldredge who punched it in and helped Dartmouth close out the game 86-0. The B-side faced off after and was just as dominant as the A side. Relentless speed on offense and hard-hitting defense helped the B-side win 70-0. It was great day for the Big Green who held its position atop the Ivy League and moved to 3-0. Dartmouth will host Princeton next Saturday.